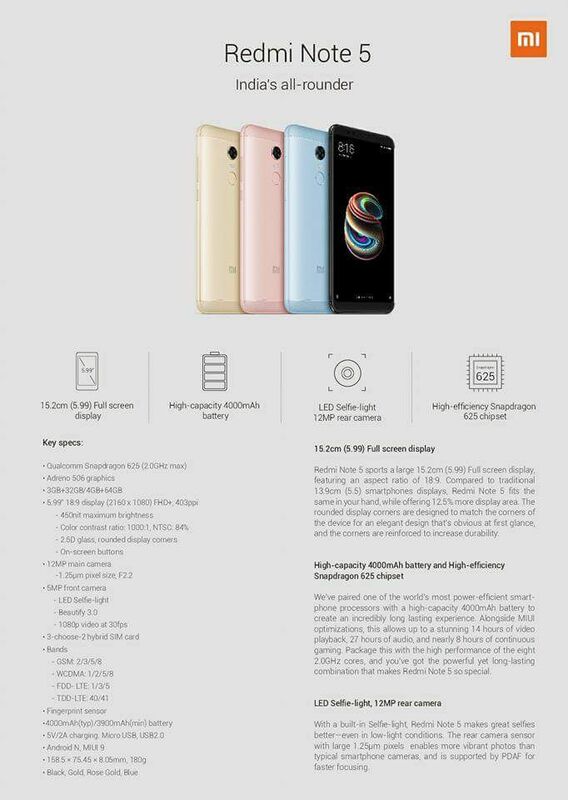 Redmi Note 5, Note 5 Pro Full Specifications, Features and Images Leaked - Playfuldroid! Rumors are rife that Xiaomi would be launching Redmi Note 5 and Redmi Note 5 Pro smartphones. 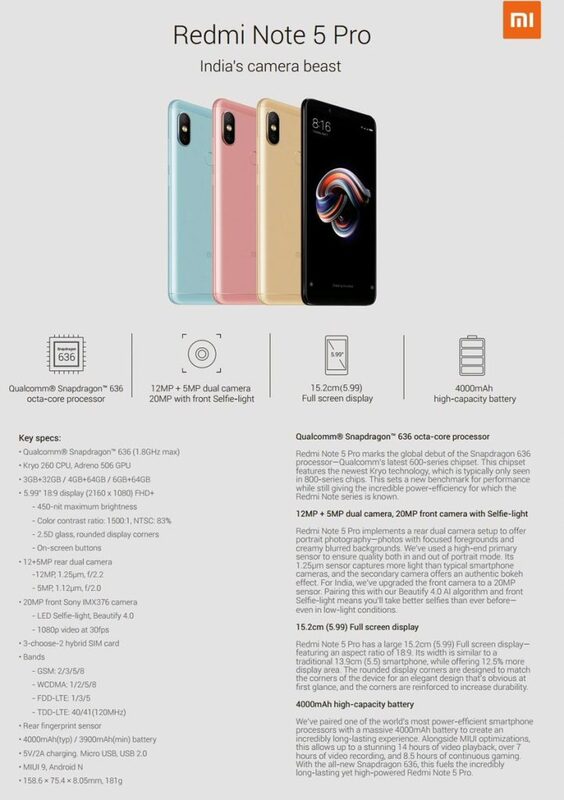 Leaked catalogues of the Redmi Note 5 and Redmi Note 5 Pro smartphones have surfaced to reveal entire specs, features and images of both smartphones. According to the leaked catalog of the Redmi Note 5, the smartphone features a 5.99-inch FHD+ display that is protected by 2.5D curved glass. Xiaomi’s love for Snapdragon 625 continues as the Redmi Note 5 is also driven by the same chipset. Its variants include 3 GB RAM + 32 GB storage and 4 GB RAM + 64 GB storage. It has a rear camera of 12-megapixel and an LED enabled front-facing camera of 5-megapixel. It includes a 4,000mAh battery and comes with usual connectivity features. The leaked specs suggest that it could be the rebranded version of Redmi 5 Plus. The catalog of the Redmi Note 5 Pro shows that it will be coming with advanced specs. It features a 5.99-inch FHD+ display and is driven by Snapdragon 636 chipset. Its variants include 3 GB RAM + 32 GB storage, 4 GB RAM + 64 GB storage and 6 GB RAM + 64 GB storage. Camera-wise, the device comes with a horizontally-aligned 12+5MP dual main snappers with f/2.2 aperture and an f/2.0 aperture respectively. It has a stellar front-facing camera that includes Sony IMX376 20-megapixel sensor that is supported by an LED flash. It is also packed with a 4,000mAh battery.